I've often found some of the most comfortable meals you can have are within your own neighbourhood. There's nothing better than finding a gem of a restaurant around the corner from you. It doesn't have to be haute cuisine. It just has to be comfortable with good food, good drinks, good service, and a good atmosphere. It helps when it's located in the beautiful Winchester Hotel. 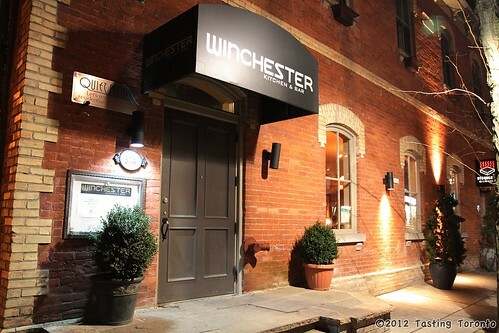 Thus you can understand my excitement when we were invited to have dinner at Winchester Kitchen and Bar at the corner of Winchester and Parliament. The place bills itself as a spot for the "three Ds:" Dinner, dancing, and drinks. Indeed they had a live band that played after we finished our dinner, and indeed there was dinner and drinks to be had. The menu is divided by size of dish (small, big, etc) so that if you decide just to come for the music, you can order some drinks and small plates if you wish. We did a full-out dinner - I ordered from the $50 five-course prix fixe menu and Mark ordered from the main menu. One thing I found more unique about this prix fixe compared to others was that an amuse bouche and a cheese course were built in. Lately when we've been out for prix fixes it's been app, main, dessert. Having a few extra bites was a welcome addition. I ordered the braised lamb ravioli, the roasted black cod, and the cherry cheese cake. Good value for $50. In terms of the standouts, the Winchestacaesar was a neat take on a Caesar, which had a richer taste than a typical one and had a cute skewer of jerky, a pickle, a pickled bean, and olives lain across the rim of the glass. I do indeed love a good Caesar. The "Three Little Pigs" started us off, with pork rillette, porchetta di testa, and a stand-in for the terrine as it wasn't available at the time. Very, very rich - we were already starting to feel a little full after having the Caesar and this "small" plate - they give you good value - was more of a "medium" plate. As a stickler for details, I study a menu carefully and I get a bit thrown off if I don't get what's on it. I guess I have to realize this can't always happen (things run out, or maybe there is a supply issue, whatever the case may be) - I just couldn't find the bee pollen on my cheesecake. Mark searched too since he's had bee pollen before and had described how much he loves it, so I was excited to try it but had no such luck locating it within the dish. Again, I'm kind of a stickler for details - we are who we are :) All that said, I had a really good time there, again loving the vibe of the neighbourhood and the building as well as the interior, which is really neat as you'll see in our pictures. I think I still dream of the perfectly-executed fish. If you are in the area you should stop in and try it for yourself - that prix fixe is quite a good value and the cocktail list is pretty extensive. I'll cheers to that!